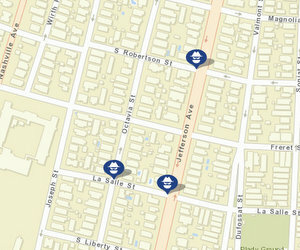 A quick spree of three carjacking incidents was reported Saturday night all within steps of the busy university-area intersection of Freret Street and Jefferson Avenue, New Orleans police said. At about 9:20 p.m., the victim was entering her Toyota Tacoma which was parked in the 5400 block of Lasalle Street when three unknown male suspects approached her. One of the males produced a handgun and demanded the victim to exit her vehicle and hand over her bag and cellphone. The victim complied and the three suspects entered the victim’s Tacoma, but were unable to start the vehicle. The suspects then exited the vehicle and fled on foot. A very short time later, the three suspects arrived in the 2200 block of Octavia Street, where a second victim was parking his 2013 white Yamaha Vino Scooter, Louisiana license plate number MC620073. The three suspects approached the victim, one of the suspects pointed the handgun at the victim and demanding he get off the scooter. The victim complied, then one of the suspects mounted the scooter and fled south bound on the scooter. The other two suspects followed on foot. A few minutes later, in the 5400 block of South Robertson Street, two unknown suspects approached two victims that were exiting out of a driveway inside a 2015 Red Toyota Rav4. One of the suspects pointed a handgun at the driver and demanded that both victims exit the vehicle. After the victims complied, both suspects entered the vehicle and fled eastbound on South Robertson Street. The three incidents occurred within a 20 minutes span. Through follow up investigation of those events, it is believed that the same perpetrators committed all three incidents. All three suspects were described as black males with thin builds, between the ages of 18 and 24-years old, about 5’8” to 6’ tall, they were wearing dark-colored clothing and had a dark-colored cloth covering the bottom portion of their face.